Transportation Authority Continues to Battle County’s Congestion One Project At A Time – Peninsula Moves! In September, local officials fit another piece into the County’s “transportation puzzle” with the groundbreaking of a $75 million infrastructure improvement project at the Highway 101 interchange on Broadway Avenue in Burlingame. The construction project— which will improve traffic flow, ease congestion, and enhance safety conditions for bikes and pedestrians—will be partially funded by the San Mateo County Transportation Authority (TA), the entity that collects and manages the county’s transportation tax dollars. The improvement project on Highway 101 in Burlingame is just the latest in a series of vital infrastructure upgrades paid for in part by the TA, which was established in 1988, when San Mateo County voters first approved Measure A, a self-help measure that collects a half cent from local sales tax receipts to dedicate funds for transportation programs and improvements. Planning for congestion relief projects is more like fitting together the pieces of a jigsaw puzzle because there is no singular approach, funding source, or agency that will handle the project from cradle to grave. Transportation planners look at the congestion puzzle in a holistic way, considering land-use questions, availability of alternative transportation and roadway improvements as equally valid answers to that question. Planners then work with local, regional and state agencies to identify the right approach to address the problem and enough funding to complete the project. As a self-help county, San Mateo is fortunate to be able to take a direct hand in solving its transportation challenges. The more than $1 billion invested in county transportation needs is evidence that this approach has been successful since the first Measure’s inception more than 25 years ago. 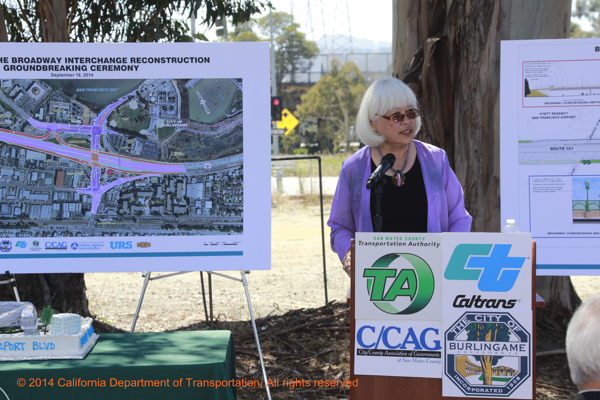 TA board member Karyl Matsumoto speaks at the 101/Broadway Interchange ground breaking ceremony. The first major project completed with the help of Measure A funds was the construction of a new southbound on-ramp and overpass to Interstate 280 at D Street in Daly City. The project, completed in 1994, allowed improved vehicle access to the SamTrans Park and Ride Lot at Junipero Serra Boulevard, which in turn greatly accommodated the increased traffic associated with opening of the nearby Colma BART Station in 1995. Two years later, the TA helped alleviate congestion on Highway 101 near the Dumbarton Bridge by providing funds for the construction the Marsh Road Interchange. Before work began on the project, rush hour traffic backed up for hours, as more than 20,000 riders a day navigated a narrow, two-lane artery at the intersection. With the construction of the new interchange, that thoroughfare was increased to four lanes, including bike lanes and sidewalks. Metering lights were also installed at the interchange to help manage traffic. The TA also began to add auxiliary lanes to Highway 101 in 1997 as part of three-phase project funded by Measure A receipts. Eventually completed in 2012, the Highway 101 Auxiliary Lane Project extended lanes along a 26-mile stretch in San Mateo County, allowing for vehicles to merge more seamlessly and making traffic flow more smoothly along the busy corridor. In 1999, the Eastmoor Avenue off-ramp was built along Interstate 280 in Daly City, another project paid for with Measure A funds. Before the off-ramp was constructed, more than 260 accidents over a three-year period were reported at the site. The next project to be completed and paid for with Measure A funds was the widening of Highway 92 in Pilarcitos Creek. Finished in 2000, the $18.5 million undertaking widened the highway, added medians and other improvements along a 1.8 mile stretch between Pilarcitos Creek and Highway 35. The Oyster Point Interchange, officially finished in 2005, was one of the biggest projects undertaken by the TA. Construction began in 1993, and included a new overpass on Highway 101, modification of on and off-ramps, the addition of northbound and southbound auxiliary lanes, and the removal of an existing pedestrian overpass. Eventually new ramps were built from Highway 101 to Bayshore Boulevard, allowing motorists to connect with Brisbane and South San Francisco. The entire project cost $87.5 million, with Measure A funds providing $37.5 million of that total. Half Moon Bay is one of the many towns on the Peninsula to benefit from Measure A funding investments. In 2008 work was completed on a $21.8 million project to widen Highway 92 at the entrance to the coastal town. The plan also added bike lanes to Half Moon Bay’s Main Street, along with decorative street lighting, trees and other landscaping improvements. The TA provided $12.6 million of the total project costs. Since implemented, it has helped bring smoother intersection operations to Half Moon Bay, as well as reducing traffic delays and increasing access for bicycles and pedestrians. Prior to the Broadway interchange project on Highway 101, the most recent undertaking completed with Measure A funds as the Belmont Pedestrian/Bike Bridge. Finished in 2011, the 2,460-foot long bridge removed bikers and walkers from traffic, dramatically improving safety conditions at the Ralston Avenue intersection. Due to the benefits of the plan, it received an American Public Works Association’s Award for a Transportation Project Over $5 million. For more information about the many initiatives paid for by Measure A and overseen by the TA, visit here. A more pressing project to help traffic flow up/down US 101 is a redesigned 101/92 interchange, in particular the NB101 to EB 92!